Andy van den Dobbelsteen (Professor of Climate Design & Sustainability at TU Delft) was suprised with a Royal Distinction during the annual Royal Distinction Day or ‘Lintjesregen’. 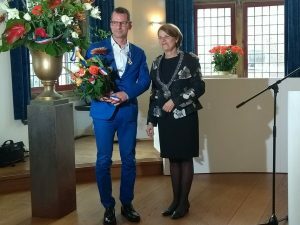 He received the distinction ‘Ridder in de Orde van de Nederlandse Leeuw’ at the Delft town hall from Delft mayor Marja van Bijsterveldt. Andy has been dedicated to sustainable solutions for over twenty years, through his work at TU Delft and his efforts in sharing his knowledge through research, education, and numerous initiatives dedicated to creating a sustainable future.